We’d love your help. Let us know what’s wrong with this preview of The Road to Little Dribbling by Bill Bryson. To ask other readers questions about The Road to Little Dribbling, please sign up. I loved your new endeavor, but what the hell is Little Dribbling? Is it required that I read Notes From A Small Island first? Find Your Next Vacation...in a Book! But swap in the UK for "cloud". I've read all of Bryson's other stuff, far as I recall. I have greatly enjoyed it. I laughed so hard at parts of In a Sunburnt Country that I could scarcely breathe. But this? This is a rambling, crotchety old coot, and not in a good way. There are love poems to verdant landscapes and well-designed museum spaces. But then there are rants against stuff like stupidity that are pretty much complete non sequiturs. There are sections about a single museum lon Basically? Bryson basically hates cars and parking lots, urban development, any town that's not stuck in 1950, being denied a pre-dinner drink, ugly architecture, the public transit experience... There is also a number of uncomfortable and socially unacceptable comments that leave one feeling a lot like the moment after That Uncle just said something appalling at Thanksgiving dinner. Anyhoo, I was so excited about The Road to Little Dribbling that I pre-ordered it and I started reading it as soon as it arrived. It begins with an amusing story of you being hit on the head by a parking barrier (ouch! ), and then meeting with your publisher to discuss ideas for your next book. He mentioned it had been 20 years since the publication of Small Island, and what a spanking good idea it would be to travel around Britain again! It was a good idea. You wrote some amusing anecdotes of your travels around England, which made me chuckle. And you tried to go to different places than you had been before, but you did revisit a few spots. I especially enjoyed your stories about the Seven Sisters and Runnymede, and you included interesting details about whatever region you were in and even some current events. Overall it was a delightful read. However, and I mean this as kindly as possible, this book was a bit disappointing. Now, please don't get upset, perhaps my expectations were too high, and it's good to remember how difficult it is to write a fantastic travel memoir. But this book just lacked... something. I finished this weeks ago and since then I have been struggling to put into words why I found it wanting. I wasn't one of those readers who found you too grumpy (although you do seem a little less charitable than in your previous books, but I understand how difficult it is to get older). No, I think my quibbling comes from the content itself. There just wasn't as much meat in this book, the stories weren't as rich. This book was superficial in a way your previous travel memoirs weren't. Again, please understand I still enjoy your writing and will likely buy whatever book you write next, whether it's history or another memoir. Happy travels to you, and please be careful you don't bonk your head again. This was not fun. It was like travelling 'round Great Britain with my rather grumpy father in law who only wants to talk about how good things used to be and how crappy things now are. Bill Bryson is the stand-up comedian of travel writing. The Road to Little Dribbling is an update on his first act, Notes From a Small Island, of 20 years before. The style of loving sarcasm is the same. With the narrative sense of David Sedaris and the one-liner punch of Jackie Mason, he renews one's faith yet again in the raw wit and humour available in Britain and most importantly the British willingness to apply that wit and humour to themselves. It is impossible to read his explanation of things like the British road numbering system or post code designations without falling in a heap. The throw away lines like "The [ancient humanoid] Happisburgh people were not like modern humans. They weren’t even like John Prescott." demand to be read aloud to one's spouse or any sentient being you happen to be sitting next to on the bus. And make no mistake: Bryson is a Brit writing for the British. Bryson and I have been channeling each other since we both fetched up in pre-Thatcherite Britain from America in the early 1970's when houses were cheap, plumbers were bolshie, post offices were in every village and the M25 was yet a distant dream. We share the overly sentimental opinion that Britain reached its peak of societal perfection sometime in 1975 because of these very things. Neither of us could bear to be separated from this island haven. So we found ourselves a couple of NHS nurses in anticipation of old age and settled into a routine of blissful exceptionality that was then afforded to Americans who were forgiven almost any social ineptitude simply because there weren't all that many of them around and they were moderately quaint in a colonial sort of way. Both of us also delayed applying for British citizenship for about 40 years - I suspect because when we first arrived no one was particularly interested in how long we might stay or if we were employed or not. In my case a lovely woman knocked on my door my first week in the country to ask if I would like to be inscribed in the electoral roll. So never having been made to feel like an 'alien' as the Americans say, there didn't seem to be much point in formal citizenship. This was of course before the rise of terrorism...or Donald Trump. And our appreciation of Britain follows a similar script: there may be decrepitude in Britain but this is somehow quaint, or at least limited in scope compared with the US. Britain's bucolic beauty is incomparable - never overwhelming but always profound. Britain, unlike the USA, layers its history rather than levelling everything to new foundations, a fact which is apparent whether one is roaming London streets or gazing over a Cotswolds vista. Nothing seems to entirely disappear: the Roman road has become a farm track; the 16th C toll road is now a quiet lane outside one's house, the 18th C post road is the a largely unused A road which has now been superseded by the motorway. Indeed it is a place wherein the centuries blent and blurred as Rupert Brooke claimed. And it is this physical continuity, which is a consequence of what Bryson calls ‘happy accidents’, that is most appreciated by Americans (well at least two of them) and least noticed by cradle-Brits. Britain, like its former empire, is an largely unintentional place. It is this apparent un-intentionality that perhaps makes Britain British (or England English if the Scots, Welsh, Cornish, and Irish object). As Bryson knows "The first principle of a British system is that it should only appear systematic." From common law to the common land parks of London, the entire culture is the result of fortuitous muddle rather than programme. Britons take this entirely for granted, but it continues to fascinate Bryson (and me). The physical continuity available in Britain certainly fills a cultural lacuna of mine, having grown up in the New York City of Robert Moses, the primary characteristic of which was its periodic mass destruction throughout the 20th c. What worries Bryson is that the very unawareness by the British of this historical treasure is the most significant threat to its continued existence. Britain is, unintentionally but fortunately, a theme park of not just Western but Anglo-Asian, Anglo-African, Anglo-Caribbean and, perhaps disturbingly, Anglo-American culture. A Bill Bryson book will rarely let you down. It is a reliable companion if you want to have a jolly time. That said, this book cannot avoid comparison with one of Bryson's best - Notes from a Small Island. According to my calculations, laugh-out-loud moments in More Notes clocks in at around 0.264 that of the Original Notes. This book is more like a long afterword to the original, but if Bryson has more to say about any place, even if a more geriatric, petulant, and less funny version of the Bry A Bill Bryson book will rarely let you down. It is a reliable companion if you want to have a jolly time. That said, this book cannot avoid comparison with one of Bryson's best - Notes from a Small Island. This book is more like a long afterword to the original, but if Bryson has more to say about any place, even if a more geriatric, petulant, and less funny version of the Bryson you expect, you better pay attention. You will still get more laughs than from most books, at least from those that attempt to entertain as well as inform. I have said it many times before, but it really cannot be stated too often: there isn’t a landscape in the world that is more artfully worked, more lovely to behold, more comfortable to be in, than the countryside of Great Britain. It is the world’s largest park, its most perfect accidental garden. I think it may be the British nation’s most glorious achievement. I've been trying to get my American arse over to England for my entire life, and, every time I fail to do so, I embrace a new British travelogue to soften the blow. I figure that, by the time I get there, I'll have read so many books on the subject, I'll be an expert, but it's also possible that I'll be so old, I'll have forgotten everything I ever learned. Ironically, I had never read Bill Bryson's original travel book about England, Notes from a Small Island, which came out a little over 20 year I've been trying to get my American arse over to England for my entire life, and, every time I fail to do so, I embrace a new British travelogue to soften the blow. Ironically, I had never read Bill Bryson's original travel book about England, Notes from a Small Island, which came out a little over 20 years ago. 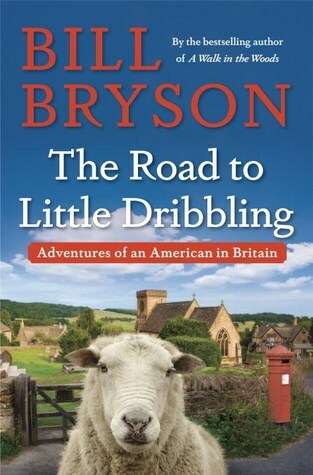 Instead, I started with The Road to Little Dribbling, which was published in 2015, right as Bryson was pursuing British citizenship. Bill Bryson was born American, in Iowa, but his wife is British and they decided, decades ago, that they were going to live in Britain and raise their children there. If you've been living under a rock and aren't familiar with Bryson, he's a prolific writer of non-fiction, largely satirical and humorous travel books, but some autobiographical ones as well. This is my third Bryson book, and I enjoyed it, but I must say. . . Wow, is he starting to sound like a crotchety, cantankerous old geezer! Parts of this are comforting and laugh-out-loud funny, but many (too many) parts of this are him droning on and on about what a load of sh*t all of society has become. It's not that I delight in men with tattooed knuckles who blow airhorns at football games or women who feed their babies Mountain Dew from their bottles; I do not. But, reading someone's same depressing sermon on society for almost 400 pages was a bit much. And, damn, does the man love infrastructure or what?? Good God, I learned more about highways and byways and bridges and buildings than I EVER wanted to learn. Yet, he can write an entire book about England and NEVER mention William Shakespeare or Geoffrey Chaucer or Thomas Hardy, and when he ends up in the village of Chawton, he can only find it in himself to refer to Jane Austen as one of two of our “most celebrated local authors” and writes two insignificant paragraphs about her. And how does someone manage to go to Derbyshire without even MENTIONING one Mr. Fitzwilliam Darcy and also manage to visit Cornwall without even once mentioning the phenomenon that is Doc Martin? It's clear that Mr. Bryson and I have some VERY different ideas about what we want to do in England! I'm giving this four stars for its overall readability, solid writing and some good laughs, but I think I'm going to make my next Bryson book A Walk in the Woods. Notes from a Small Island was first published 20, yes 20 years ago. In that book he visited place new and revisited old haunts from when he first came to UK in the seventies. His points of view as an outsider were refreshing, fairly blunt and quite frequently very funny. The book came about after his publisher remarked that it might be worth having another look at the country now he was actually a citizen. He did consider doing a journey between what most people think of as the two furthest point Notes from a Small Island was first published 20, yes 20 years ago. In that book he visited place new and revisited old haunts from when he first came to UK in the seventies. His points of view as an outsider were refreshing, fairly blunt and quite frequently very funny. The book came about after his publisher remarked that it might be worth having another look at the country now he was actually a citizen. He did consider doing a journey between what most people think of as the two furthest points, Lands End and John O’Groats. But a couple of coincidences mean that he starts in Bognor Regis of all places, with the intention of aiming to end at Cape Wrath. He follows a very erratic journey round the country visiting new towns and passing through some of the places he visited in the first book. He unearths a variety of factual nuggets and anecdotes on each place, reminds us of how it once was and is often pretty blunt with his opinions on some of the changes that have taken place. Being older now he is a little more of a curmudgeon too, but it does make for some hilarious encounters with surly and unhelpful staff in hotels, restaurants and the attractions that he visits. This is a country though that he loves with a passion; he is not afraid to point out the dumb things we do as a country, and he is particularly scathing of mediocrity, be it celebrity and political leaders. But he also celebrates the places we have, the beautiful natural country, the history and culture that stretches back thousands of years. He has even compiled a list of just how long it would take to visit each historic site. But even though he has lived here for years now, this country still has the ability to perplex, madden and more importantly gladden him. I am like a grumpy, old(er) man ... I thought that of myself when listening to The Road to Little Dribbling. Just for a little while. Bill Bryson's grumblings about people, service or lack of service, and the general lack of proper grammar and punctuation are just some of the things we have in common. But then, I remembered that Bryson's older books, written in his 40s, were similar, so I will just call him, and myself, critical thinkers who are fed up with the lowest common denominator, and whe I am like a grumpy, old(er) man ... I thought that of myself when listening to The Road to Little Dribbling. Just for a little while. Bill Bryson's grumblings about people, service or lack of service, and the general lack of proper grammar and punctuation are just some of the things we have in common. But then, I remembered that Bryson's older books, written in his 40s, were similar, so I will just call him, and myself, critical thinkers who are fed up with the lowest common denominator, and when noticing things are vocal about it. Bill Bryson, you're one of a kind! How I love thee. I love your sense of humour and I am grateful to you for making me laugh out loud. I love your sarcasm; obviously living in the UK for over forty years has made you more sarcastic, because, let's be honest here, Americans are not known for their sarcasm. I love your appreciation of museums, trains, nature and your lack of pretences when it comes to expensive cars, clothes and other typical signs of affluence people like to display. I love how you're so interested in all sort of facts, many of them, obscure, and you resurrect some of the people that history had forgotten and that you bring to my attention facts and tidbits that I never thought I would find interesting. And yes, I love that your statements are supported by data, statistics and facts. I love that you're self-deprecating. You're one special kind of person. We need more people like you. Britain is lucky to have you. And we are lucky to have your books. "…the boy was gone and the crisp packet was on the ground. There was a bin three feet away. It occurred to me, not for the first time, that if Britain is ever to sort itself out, it is going to require a lot of euthanasia." "But then, I suppose, that is the thing about the internet. It is just an accumulation of digital information, with no brains and no feelings – just like an IT person, in fact." American-born writer Bill Bryson has been living in England so long he's written a sort of 20th anniversary sequel to his popular Notes from a Small Island. While The Road to Little Dribbling may sound like more of the same, Bryson made sure to steer clear of the For all its stogy, stoicism and unspoken rules of social etiquette, England is a peculiar place full of strange people doing odd things. Many and more are found here in The Road to Little Dribbling: Adventures of an American in Britain. This one kind of broke my heart a little. Bill Bryson is a master of the English language. He wields it not as a sword in fiery rhetoric, and not as a scalpel in poetry. He uses it as a hug with some light tickling. Reading his books is an exercise in warm, comfortable conversation with someone who likes and admires you. He complains, he trips, he discovers fascinating things and people, and you're there for all of it. But poor old beleaguered Bill is now an actual old ma This one kind of broke my heart a little. 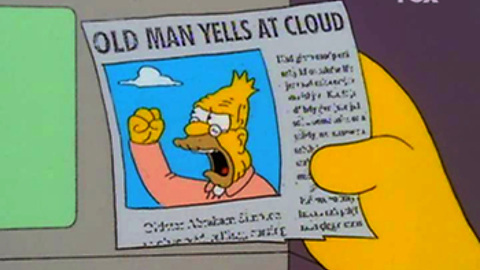 But poor old beleaguered Bill is now an actual old man who: goes into an electronics shop and is astonished by Bose headphones, is outraged by the cost of a sandwich, has to sit in traffic, thinks television shows are pretty bad, it goes on. It's nothing more than his complaints and idle musings. They're done with charm, but no real interest. It feels like it was dictated from his daily muttering. (3.5 stars) I read once that the furthest distance the average American will walk without getting into a car is 600 feet, and I fear the modern British have become much the same, except that on the way back to the car the British will drop some rubbish and get a tattoo. I’ve spent many happy hours in Bill Bryson’s company since I first read his delightful Notes from a Small Island (for the first time) some 15 years ago. I’ve chuckled to the sound of his voice narrating his own quirky-brainy anecd (3.5 stars) I read once that the furthest distance the average American will walk without getting into a car is 600 feet, and I fear the modern British have become much the same, except that on the way back to the car the British will drop some rubbish and get a tattoo. I’ve spent many happy hours in Bill Bryson’s company since I first read his delightful Notes from a Small Island (for the first time) some 15 years ago. I’ve chuckled to the sound of his voice narrating his own quirky-brainy anecdotes while cycling to work; I’ve giggled, hand over mouth, above the Atlantic Ocean while reading one of his books in a cabin full of sleeping passengers, my reading light being the only one turned on. This book is the sequel to Notes from a Small Island, published almost 20 years ago, and this time he decides to travel along ‘the Bryson line’ – from Bognor Regis in the South of England to Cape Wrath in the North – his idea of the longest straight line possible on the map of Britain. There’s something decidedly heartwarming and wistful about Bryson’s nostalgic trip around Britain. He is a font of information about all things British, historical and current, and though he still has the keen eye of the knowing outsider – being an American from Iowa – this book bears evidence to his greater familiarity with Britain since his first book. To be honest, however, this one seemed more of an economic enterprise than the first book. I still loved many of his digressions and anecdotes, but there was, at times, too much inconsequential and repetitive rambling that seemed stretched out for the occasion. Also, he is infinitely grumpier this time round. All is not as it should be in the paradise that is Britain. But then he, like the rest of us, has gotten older, and Britain has changed, too. I can bear witness to that myself. He is on a mission in this book, I felt, telling anyone who’ll listen that e.g. the British countryside should be preserved, that people should think twice before covering the country with litter, that the level of stupidity (notably in Austin, Texas; only partially in Britain) is becoming critical. To a large extent I agree with him, but he came off a bit too angry some of the time, whereas previously he was merely funny, even when complaining about the state of things. I also felt the f-word was strewn a bit too generously into the anecdotes. I’m no prude, but it underlined how curmudgeonly this usually gentle American expat has become. (Part of the problem could simply be over-exposure to Bryson’s tried and tested formula, charming and humorous though it often is). -	Cows are more dangerous than bulls and have actually killed ramblers in Britain (Bryson goes out of his way to downplay this problem because people were developing a fear of cows, but I just never knew cows had it in them to trample people so it was news to me). -	The British citizenship test which he takes at the beginning of the book is clearly as stupid and ridiculous as the Danish equivalent, making it nearly impossible for any normal native of the country to actually pass. (His description of this test was just priceless. He did pass it though and is now officially a Briton). Read it if, like me, you have a small crush on England, enjoy a good dollop of encyclopedic fun facts and travel commentaries and a narrator who doesn’t take himself too seriously. If you’ve never read him before, begin with Notes, but do begin. He's become the Paul McCartney of travel writing; once sublime and now pushing out books that we buy because he's given us so much pleasure in the past. Maybe it's very clever writing: the ageing scribe and observer returns to look at England and finds it changed mostly for the worse and so reflects this in his prose; also changed for the worse. There are a few laugh out loud moments; but these are largely fart jokes. I don't mind a curmudgeon and age suits this persona. I just don't much like t He's become the Paul McCartney of travel writing; once sublime and now pushing out books that we buy because he's given us so much pleasure in the past. Maybe it's very clever writing: the ageing scribe and observer returns to look at England and finds it changed mostly for the worse and so reflects this in his prose; also changed for the worse. There are a few laugh out loud moments; but these are largely fart jokes. I don't mind a curmudgeon and age suits this persona. I just don't much like the name dropping multi-millionaire with friends in academe spending half a day in so many towns and then bemoaning that they're not what they could be. My own home town of Barrow comes in for a particularly sneering write-off when he walks along the economically depressed Dalton Road and is offended that there are some unemployed people there making the place look untidy with their dogs. Surely, after travelling many miles (there is no other way of getting to Barrow) he might have had a wander around the rather good Dock Museum; after-all he does like a museum in middle class towns; the glorious beaches and nature reserves of Walney or the silent splendour of Furness Abbey, the incomparable loveliness of Roanhead, even the size and purpose, ugly but impressive, of the Devonshire Dock Hall; all within walking distance of where he was. No, a cup of coffee in a chain was his idea of the acceptable face of a town I am very fond of. I'm glad he finds fault with the political mind-set that sees cheese-paring as the route to making Britain great again. We won't improve anybody's quality of life, or even save much money, by closing down libraries or removing greenery from urban plazas. But I'm afraid his outsider's ability to spot the glories and weaknesses of British life has declined with passing years. Seeing the world through the windscreen of a car; and I'd imagine a big car at that; re-tracing steps he specifically says he won't re-trace, rehashing old material about the supposed delights of dried cake and hard biscuits, having a pop at a popular travel writer (in this case the pop-worthy HV Morton): it's all a little tired. It isn't a bad read but it is by no means a good one. Like Paul McCartney he re-invigorated his genre and delighted a generation. The old stuff is still worth the read (especially Notes From a Small Island and the wonderful Walk in the Woods) but this is Red Rose Speedway. The main criticisms of HV Morton (and it has become fashionable to find fault with old Harry) are that he made half of it up and the rest he painted with a rosy brush. (Putting aside his serial adultery and desire to see fascism established in England). I'm afraid Bill Bryson is guilty of both (rosy paint brush and inventing encounters, not multiple shagging and longing for the Third Reich to cross the North Sea). His meetings with people seem stage-managed and mostly fiction and his admiration of the English countryside comes across as shallower than it probably is; as well as touching the clichéd. I'm also surprised and disappointed that he's reverted to the 'short walk around and then into a pub for pints of lager before a curry and bed' approach to exploring a town. The book opens with Bryson's publisher pointing out the money-making possibilities of Small Island Part II. The book is little more than an exercise in cashing in. (Incidentally it does get a little wearing when this very wealthy man objects to paying a few pounds entry fee, and downright patronising when he tells us we really should be putting more into cathedral collection boxes and be raising money for charity). The title is supposed to be an evocation of the unique and slightly humorous quaintness of English place-names. It equally serves as a description of the contents and style. I love Bill Bryson. I'll just state that right up front. I've read other of his books, though not all, and enjoyed them immensely, but I think this is my favorite so far. Maybe because he is honest from the outset that he is 65 years old, and somewhat of a curmudgeon, but has earned the right to grouse about, among other things: aging, the younger generation, people who litter, stupidity (individual and political), incorrect punctuation and grammar from those who really should know better, and t I love Bill Bryson. I'll just state that right up front. I've read other of his books, though not all, and enjoyed them immensely, but I think this is my favorite so far. Maybe because he is honest from the outset that he is 65 years old, and somewhat of a curmudgeon, but has earned the right to grouse about, among other things: aging, the younger generation, people who litter, stupidity (individual and political), incorrect punctuation and grammar from those who really should know better, and the cost of things. Those are subjects I can really get behind and agree with anyway, but Bryson is just so funny and snarky that it's a joy to ride along with him. Actually I should say walk, as he does a lot of it in this book, as he visits some places for the first time, and revisits places he saw in another book written 40 years ago, "Notes From a Small Island". He obviously loves his adopted home in England, and just recently became an English citizen, so this is a love letter to Great Britain as well. Just a warning: You have to beware of where you choose to read this book. If you read in bed at night, you will certainly wake anyone in the same room with you, and possibly the entire house, with loud peals of laughter and snorts. Ditto if you read in a public place, people will look at you like you're a fool as you dissolve in unrestrained merriment and glee. And by no means try to read this book while eating or drinking anything at all, as it will be all over the walls and table. So where to read may be a problem, but well worth it. Something is wrong with Bill Bryson. Maybe it has been too long since I last checked in with him, but this book is a cry for help, people. He hates everything—public transportation, private transportation, food, non-food. And it seems like he has forgotten the names of his family. Every chapter he goes on about "my wife." She has a name, Bill. She's Cynthia! Everyone knows this! What happened to the cheerful buffoonery and sunny outlook that lifted so many of his other books into a place of joyful Something is wrong with Bill Bryson. Maybe it has been too long since I last checked in with him, but this book is a cry for help, people. What happened to the cheerful buffoonery and sunny outlook that lifted so many of his other books into a place of joyful reading? I've always enjoyed Bill Bryson. I loved A Walk in the Woods and The Mother Tongue and his Shakespeare book, etc. This? Not this. I couldn't manage this. Yes, it was lovely to learn that we've all been pronouncing "Everest" wrong (and that George Everest never went up it). It's good to know that almost 40% of London is park and the city is almost half as populated as New York, and France and England are only 20.6 miles apart at their closest point, and such. Motopia is a very cool idea and I'm e I've always enjoyed Bill Bryson. I loved A Walk in the Woods and The Mother Tongue and his Shakespeare book, etc. This? Not this. I couldn't manage this. >“Well, pardon me for saying so, but you’re an idiot,” I said matter-of-factly. This is Bryson quoting … himself. And both times he was talking to a young person in the service industry. If he's being honest and not self-mocking or self-parodying or whatever, Bill Bryson is apparently a jackass. “Do you want fries with that?” the young man serving me asked. Seriously. I don't want to spend time with this person. When he calls Leslie Charteris "a recluse and a bigot" it feels very much like a pot and kettle pronouncement. The humor is forced, and very much largely unfunny. I'm disappointed – and I quit. This is a wonderful, entertaining, and truly funny book about Bill Bryson's return to the United Kingdom. I laughed so many times! It's not just what he writes; it is how he writes his stories, his unexpected phrases, that make his sarcasm endearing rather than irritating. In this book, Bryson returns to many of the same locations in Britain as he wrote about in his book of 20 years ago, Notes from a Small Island. He compares the progress--or lack of it--in many of these locations. Bryson tells a This is a wonderful, entertaining, and truly funny book about Bill Bryson's return to the United Kingdom. I laughed so many times! It's not just what he writes; it is how he writes his stories, his unexpected phrases, that make his sarcasm endearing rather than irritating. Bryson tells a lot about the history of the various places he visits, as well as the people behind these places. He writes a lot of social commentary, and discusses in detail many of the decisions made by city planners--both good and bad. He fills the book with all of the personal anecdotes of his travels. It is obvious that he often exaggerates, but nevertheless, he is so funny! Bryson has matured into the curmudgeonly grump that was presaged in hes previous books. And it's wonderful. A lovely book, and one where there are far too many diverse encounters to focus on any particular one, but it had me laughing on almost every page. As part of the 20th anniversary of his first Notes from a Small Island, Bryson set out to travel the “Bryson Line” – which he claims is the longest straight line in Britain from Bognor on the South Coast to Cape Wrath at the top of Scotland, though he rambles all around it and spends most of his time nearer the southern end. What a joy walking is. All the cares of life, all the hopeless inept fuckwits that God has strewn along the Bill Bryson Highway of Life suddenly seem far away and harmless, and the world becomes tranquil and welcoming and good. Not that he walked the whole island of course, there were many car, train and bus journeys, which itself provided a fund of distractions and acerbic comments about driving habits and clods with cell phones in public places. Am I wrong or is this becoming a feature of British life – and I mean by that behaving in quietly disgraceful ways when you think no one is watching? ... I just thought: is that really what we have come to now, in this cheap shittily dispiriting age - that we can’t even afford a few shrubs in a planter? This was occasioned by a visit to Durham Cathedral where he observed that 11th-century artisans lived in an infinitely poorer era yet had had not only the ability to create such a magnificent building, but the foresight to allow for a forty-year settling of the lintels and jambs to create a structure that would not be perfectly aligned until years after their death. I needed to relax with a quick audible nostalgic trip around UK. Terrible disappointment. Bill Bryson has turned into a patronising, grumpy old man. He bullies a poor kid in Macdonalds, grumbles about a cafe that he remembered now closed, whinges about traffic and I am nearly at the point of leaving this unfinished. Rudely actually names a pub because he is late at Sunday lunch and asked to wait as kitchen busy. Acted with such an undeserved sense of entitlement I was ashamed for him while reading I needed to relax with a quick audible nostalgic trip around UK. Terrible disappointment. Acted with such an undeserved sense of entitlement I was ashamed for him while reading. I tried to give this book a second chance but it just got worse. Bill Bryson continues to grumble and whine about everything. He is rude to people and thinks he's entitled to demand service and make snide remarks that are completely unfunny. "......an accumulation of facts, no brains, no feelings just like an IT person..."
"...........fuckwits strewn along the Bill Bryson Highway of Life....."
"My wife had booked me into a Slightly-Up-Ourselves Hotel, I think it was called. I admired a bunch of twigs." I became so miserable listening to this flow of bile that have returned it to audible. Far from a national treasure, as someone suggested, Bill Bryson should take his boring whining as far away from UK as possible. A really fun and informative trip around Britain with Bill. Twenty years on from Notes on a Small Island Bill is now a UK citizen and decides to embark on another trip around Britain from Bognor Regis to Cape Wrath. No town, village or city is spared Bryson's observations; nor is British Rail. This time round he invites us to enjoy and appreciate the countryside as much as he does and it worked because I have a sudden urge to fly to England and rent a car and just drive. I congratulate Mr Bryson for becoming a British citizen, but I think I need to warn him it's not like playing a computer game: i.e., when you conquer the first level, you don't have to progress to a whingeing pom level, then a grumpy old man level. I suspect I'm part of the older readership demographic that discovered Bill Bryson's unique travel books years ago and stayed for a mighty good ride as he came up with other interesting and entertaining books. I admired the stories he told, marvelled a I congratulate Mr Bryson for becoming a British citizen, but I think I need to warn him it's not like playing a computer game: i.e., when you conquer the first level, you don't have to progress to a whingeing pom level, then a grumpy old man level. I suspect I'm part of the older readership demographic that discovered Bill Bryson's unique travel books years ago and stayed for a mighty good ride as he came up with other interesting and entertaining books. I admired the stories he told, marvelled at the quirky facts and laughed out loud at the anecdotes. But I found at least a fifth of this latest book tedious. I give it three-and-a-half stars, which isn't bad. But his previous books have been five-star gems for me. I have to say his ability to find those nuggets of amazing fact or amusing anecdotes remains strong. But I'm not sure I need to know which institutions have the best cafes. At times, I got the impression that Bryson was actually sloshing around Britain, which might explain why he says the first place he usually seeks out when he arrives anywhere is the restroom -- and that's something I definitely don't need to know. Nor do I need to be reminded that my short-term memory isn't as good as it used to be either (I'm not sure if Bryson even knows he has dropped his memory-loss condition his into the book yet again. Either he's forgotten he's already done it, or he's hoping that his ageing reader has already forgotten he's already done it). So he's disappointed with the way the world is going? Austerity. Decline of service. Public neglect. Growing incompetence. Fading values. Can't say I disagree with a lot he's banging on about. But I look to books as a bit of escapism these days, so the last thing I need is to have to share someone else's bad day. "Bill is back and I’m so happy to have him! If you’ve read Bryson before, you’re feeling as giddy as I was to be treated to his hilarious voice and style. If you haven’t read Bryson before, The Road to Little Dribbling is a great place to start. In this new book, Bryson finds himself back in England, where it all began in the book that put him on the map, Notes From a Small Island. It was an absolute pleasure to read about Bryson’s British adventures. He’s the master of witty observation and one "Bill is back and I’m so happy to have him! If you’ve read Bryson before, you’re feeling as giddy as I was to be treated to his hilarious voice and style. If you haven’t read Bryson before, The Road to Little Dribbling is a great place to start. In this new book, Bryson finds himself back in England, where it all began in the book that put him on the map, Notes From a Small Island. It was an absolute pleasure to read about Bryson’s British adventures. He’s the master of witty observation and one of the funniest people I’ve ever read. Plus, I even learned or two about British culture! If there’s a better way to transport yourself to England with the turn of a page, I haven’t found it." Първа среща за мен с Бил Брайсън, но пък паметна. Този човек определено те кара да се хилиш на глас независимо дали си сам, или четеш на обществено място (не знам кое от двете изглежда по-ненормално). Една журналистка, с която си говорих за него, неочаквано прелестно го сравни с Тери Пратчет по линия на хумора. Много свежо хрумване, но за мен Брайсън е по-скоро наследник на традциите на Джером Джером, Марк Твен и моя неотменен любимец Бранислав Нушич. Да успееш да предадеш купчина малко известни Първа среща за мен с Бил Брайсън, но пък паметна. Този човек определено те кара да се хилиш на глас независимо дали си сам, или четеш на обществено място (не знам кое от двете изглежда по-ненормално). Една журналистка, с която си говорих за него, неочаквано прелестно го сравни с Тери Пратчет по линия на хумора. Много свежо хрумване, но за мен Брайсън е по-скоро наследник на традциите на Джером Джером, Марк Твен и моя неотменен любимец Бранислав Нушич. Да успееш да предадеш купчина малко известни любопитни факти за крайно затънтени местенца в Англия без грам да отегчиш читателите е талант, пред който се прекланям. Паралелът американски/английски нрави също е извор на чудесен, освежаващ хилеж. Безкрайно малко са авторите, които могат да пишат за старостта без депресивни и мрънкащи отсенки и Бил Брайсън е един от тях. „Не знам на какво се дължи, но с възрастта освен ужасно много косми, човек отглежда и много твърди нокти. Когато режа моите, хвърчат искри.” Просто няма човек, който да не се засмее на подобно нещо или ако има такъв, той е тотално лишен от хумор и аз съм радостна, че не го познавам. Нищо чудно, че в Англия са предписвали книгите му с медицинска цел. Почвам да ги „предписвам” и аз.